Happy mid-October,everybody. Have you figured out your Halloween costume yet? This week in the Basement: indiepop cult heroes Comet Gain are back, as are mid-’00s era shoegazers Amusement Parks on Fire. Meanwhile, Davey Woodward (The Brilliant Corners, Experimental Pop Band) never left. Plus: more Stereolab vinyl represses are on the way to empty your bank account, new Welsh trio Adwaith, and a collaborative LP from Spray Paint and art-punk The Rebel (Ben from Country Teasers). Need more Basement-approved music? 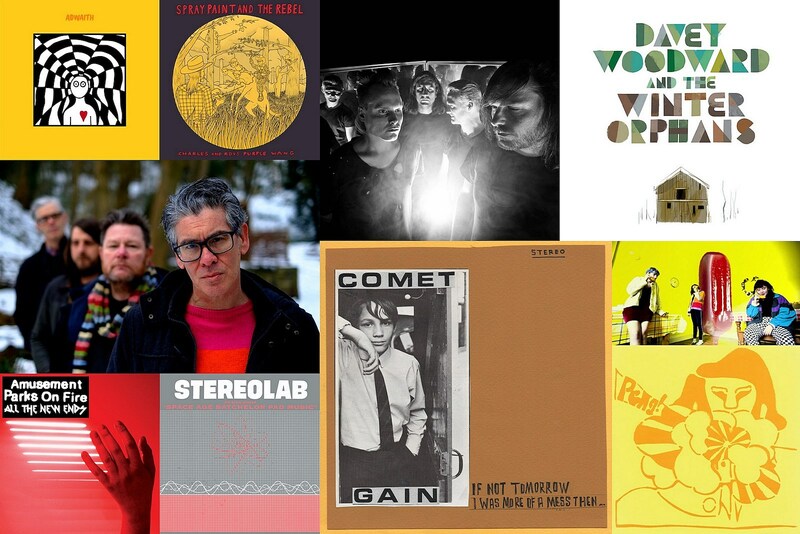 There are new albums today from Kurt Vile, John Grant, Elvis Costello, Sweden’s Les Big Byrd, and that new A Certain Ratio collection is out today, too. Plus: Klaus Johann Grobe released the best song off their forthcoming album; there are a few items of interest in this year’s Record Store Day Black Friday list; and have you heard Amy Rigby’s “Tom Petty Karaoke”? Cultishly loved UK indiepop group Comet Gain are gearing up to release their first new album in five years. David Feck, the group’s lead and sole constant, said he wanted to make a record of “short, sharp POP SONGS with one take electric abandon” but “then the world turned darker and dumber so the songs and words got angrier and fuzzier.” Instead trying to make a unified record, they “decided to place each song in an envelope and throw them in the air and catch about 14 of them and make a patchwork LP” which they recorded with Ultimate Painting’s James Hoare and longtime group member MJ “Woody” Taylor. Comet Gain’s new 7″ single is out now via Tapete. Comet Gain haven’t played the U.S. since 2012. Come back soon! Don’t expect the Stereolab reissue train to slow down any time soon. Just a couple weeks after the vinyl represses of Stereolab’s three ˆ compilations comes news that the band’s first two albums are getting vinyl reissues too: 1992’s Peng! and 1993’s The Groop Played “Space Age Bachelor Pad Music”. Both are worth at least checking out. (Stereolab’s discography… it’s a lot.) Peng! is classic early Stereolab, with a lot of droney two-chord jams, thick with in-the-red level guitars, vintage keyboards, and bah-bah-bah choruses. Space Age Bachelor Pad Music, though, is where they really started to blossom, with the late Mary Hansen joining the group and working with High Llamas’ Sean O’Hagan to bring in the loungey aspects of the band which would be a significant part of the their sound for the rest of their run. The represses are out November 9 via Beggars Arkive on clear vinyl, just like the Switched On represses are, and I am also told the groop were involved with these as well. Which is good news. And clearly there are more coming soon. Just not this year, please. My bank account can’t take it. Austin’s tense, paranoid punks Spray Paint have been focusing on collaborations lately, having worked with Dan Melchior, Protomartyr, and others. Up next for them: Charles And Roy’s Purple Wang, an evocatively titled collaborative album with The Rebel, aka Ben Wallers of art-punks Country Teasers. The record answers the question: “What would it sound like if Devo, Ian Dury, and The Residents were in a band together produced by the Daleks — you know, the robots from Dr. Who — all while taking loads of bad drugs?” It is pretty much as weird as that sounds, and also a little like “Hip Priest” era The Fall. (One song here even references The Fall). This is not for everyone or even most people but, if you’re still reading this paragraph, it may be for you. We’ve got the premiere of “Look! Air Innit?” which may cause heart palpitations in the deeply nervous. Charles And Roy’s Purple Wang is out November 16 via Ever/Never. Spray Paint’s members are kinda far-flung these days, with guitarist Cory Plump based out of Kingston, NY now, but the band are playing NYC tonight (10/12) at Brooklyn Bazaar with Drunks With Guns, Conduit, and ex-Pampers band Brandy. Davey Wwoodward is an indie lifer. Based out of Bristol, England, in the ’80s he led The Brilliant Corners, who were in the same jangly, literate, sensitive, guitar pop mode as The Smiths, The Housemartins, Lloyd Cole & The Commotions and The Go-Betweens…but with trumpet. (Their second LP, 1988’s Somebody Up There Likes Me, is pretty great if you like this kind of stuff.) When The Brilliant Corners ran its course, Woodward and bandmate Chris Galvin formed Experimental Pop Band who left the horns behind but worked in dance culture, sampling, lounge and krautrock into the mix. Sadly, Galvin died from cancer in 1998, a year after releasing their great debut LP, Disgrotesque. Woodward carried on with EPB, making records (which got progressively more band-oriented), through the early part of this decade, all of which are pretty good. Woodward layed low at the start of this decade but is back in force in 2018. In the spring he released an EP with his new group, Karen, which features some of the same members as Experimental Pop Band, and it feels like an extension of their sound too. You can listen to “Fillwood Broadway,” the title track of the EP, below. More recently he released a self-titled album as Davey Woodward And The Winter Orphans which he formed with a desire to record with an entirely new group of musicians. This is the closest Wooward’s ever come to folk, but his style — songs as short stories with interesting characters, told in a half-sung-half-spoken voice — is as vivid as ever. There’s a distinct chilled-out Velvet Underground vibe here, and the closing song on the album, “Dylan’s Poster,” is a clear “Sweet Jane” homage…with trumpet! Some 35 years on from The Brilliant Corners debut single, Woodward is keeps on doing what he does, and for that I’m grateful. Adwaith are a trio from Carmarthen, Wales, who have been making indie rock in their native tongue for about two years and today release their debut LP, Melyn (which is “yellow” in Welsh) via Libertino. Musically, these three are a little all over the map. “Lipstic Coch” and “Dan Y Haenau” are jazzy pop not unlike what Stealing Sheep did on their first album, while “Y Diweddaraf” and “Osian” are more along the lines of current garagey groups like Goat Girl. You can hear post punk like Siouxsie & The Banshees too. There is no shortage of creative across these 15 tracks (which clock in around 38 minutes) and, despite the wide variety of styles, most of the them segue into one another which helps Melyn really hold together as an album. You can stream the whole thing below. We’ve also got the premiere of the video for “Y Diweddaraf,” one of the standout songs on the LP. “We wrote the music and lyrics together as a band in our rehearsal space, jamming the opening hypnotic riff over and over,” they say. “The song is a reaction to everyone saying leaving uni to do music was stupid! It’s about feeling empowered to do whatever you want regardless.” As for the video, it follows a similar theme. “The video represents life being too short and you should just have fun, experiment and live as if you care less for what people think of you.” Hard to disagree with that. Adwaith will be on tour starting tonight in the UK with another Welsh-singing artist, Gwenno, which is a very nice pairing. I never followed Amusement Parks on Fire too closely, but as a big fan of OG ’90s shoegaze I was always interested. Their 2004 self-titled debut album, which came out on Portishead member Geoff Barrow’s Invada label, roared like Swervedriver and Dinosaur Jr and had pop hooks hidden under all those guitars. (It was all the more impressive knowing that Michael Feerick pretty much made the record entirely on his own.) Its follow-up, 2006’s Out Of The Angeles, was much more of a widescreen effort, soaring stuff. They toured a lot, including runs with L.A. shoegazers Silversun Pickups, but wouldn’t make a third album, Road Eyes, until 2010 and was a record that went way too epic for my personal tastes. After six-plus years of inactivity, Feerick revived Amusement Parks on Fire, releasing 2017 single “Our Goal to Realise,” and this year dropped the All the New Ends EP back in the spring. I only realized they were back a couple weeks ago and, after the overblown nature of Road Songs, didn’t really pay much mind. However, this is the Amusement Parks on Fire I liked 14 years ago. The bombast has been excised but they kept the big, layered guitars and hooks. It’s poppier than their early stuff but not saccharine the way Road Songs was. “All the New Ends,” the title song, is right on the edge of that, but veers more towards Andy Bell’s catchiest Ride moments. The best song on the EP, though, is the nearly 13-minute “Infernal Flame,” which hammers away on a descending chord pattern till it becomes hypnotic. You may even forget there were ever vocals on this song to begin with, at least till the band pull everything back in for an anthemic finish. That’s something I’d like to experience live. Connecting those two songs, “Temporal Rinse” is pure atmosphere and makes one seamless 20-minute trip. (The EP is shoegaze’s ideal format.) Welcome back, Amusement Parks on Fire.